I spend a lot of time in cafes when I travel around the world. It’s not just the caffeine buzz that I’m hooked on. Any coffee lover will know that its more than just a drink. Coffee a way to socialize, slow down and gather you’re own thoughts. No matter where you go in the world and how different it is from home, a cafe is always a cafe, and that’s a comforting thought. Whether you’re in a busy city, or a remote village, coffee symbolises togetherness all over the world, and so many cultures would grind to a halt without it. One of the aspects that is so appealing about travel is immersing yourself in the local culture and I think you’re more likely to find that in a country’s coffee shop, rather than it’s museums. There’s a world of unique and unusual coffees out there so, if you love nothing more than watch the world go by over a cup of coffee, then pick a country and whisk yourself off to it, espresso. Vietnamese food gets a lot of praise, but one thing you hear less about is its fantastic variety of coffees. Its coffee shops vary drastically from place to place, from traditional street side cafes in Hanoi’s Old Quarter to a thriving cosmopolitan coffee scene in Ho Chi Minh City. You have to try the traditional Vietnamese filter coffee, served with sweet condensed milk, and the weirdly wonderful meringue like egg coffee in Hanoi is one for the bucket-list. 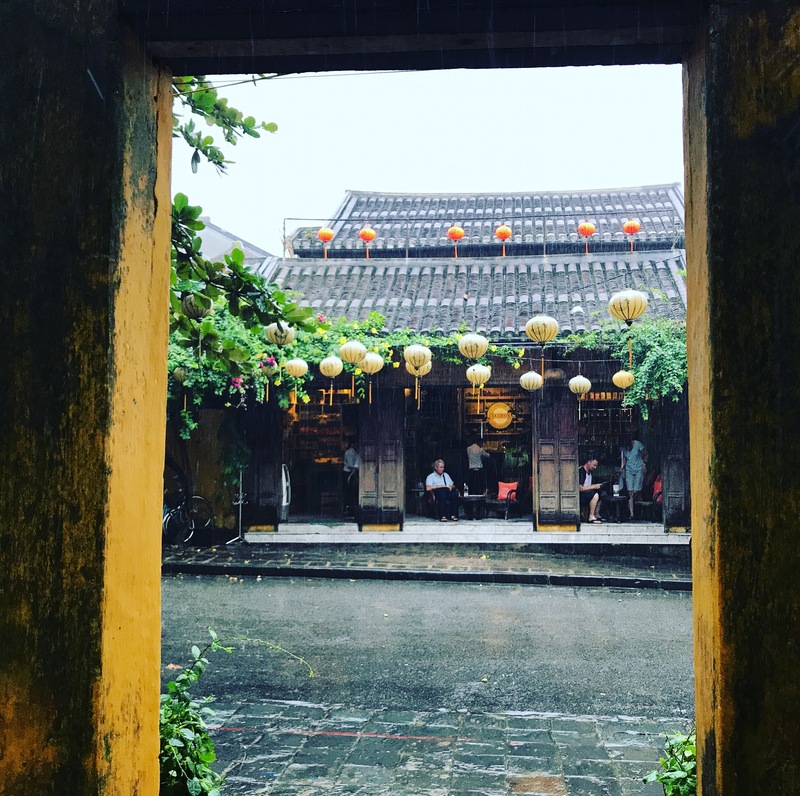 Any coffee fanatics will love the beautiful city of Hoi An, with more Instagram worthy cafes, (and streets),than you could possibly fit in. Be sure to visit: Cafe Pho Co in Hanoi, with a hidden entrance through a silk shop that’s famous for its egg coffee, and Hoi An Roastery in Hoi An for its coconut milk coffees. What could be nicer than sitting outside on an Italian summers day with a cup of coffee, a pastry and the warmth of the sun on your face? The Italians are real coffee lovers and without it the country would grind to a halt. As a whole, the Scandinavian countries drink more coffee than anywhere else in the world and the top coffee consuming country is Finland. It’s estimated that the Finnish drink around ten cups of coffee a day, that’s enough to help burn off all of the cakes they eat with it. In fact coffee and cake is so important that they even have their own word for it. Kakkukakvi is a Finnish concept that literally translates to ‘coffee and cake’, so it shows you how integral it is to their lifestyle. The most unusual Finnish coffee is Kaffeost. This strange drink is made by putting chunks of cheese into a cup and pouring coffee on top of it. You eat the cheese at the end with a spoon. Not sure if its everyone’s cup of tea though. Be sure to visit: Good life Coffee, Helsinki, for excellent no-nonsense coffee and laid back vibe. The Greeks love of coffee is so strong that you’re just as likely to see groups of teens sipping coffee at a rooftop bar, as you are a cocktail. You’ll see plenty of locals sat outside drinking thick greek coffee while playing games of Tavli, (Greek Backgammon), but its the cappuccino and Espresso Freddo’s that are the real stars of the show. These popular iced coffees are usually served fantastically sweet, and the silky topping of the Cappuccino Freddo is somewhere between cream and milk, but I’ve never quite sussed out what it is. It makes sense that one of the main coffee exporters is a must visit destination for coffee addicts. Of course, the city of Antigua’s stunning multicoloured buildings and fun-loving Spanish culture are reason enough to visit this `Central American country, but drinking an espresso in the very country it was grown is one for the bucket list. Be sure to visit: Fernando’s Kaffee in Antigua for its celebration of locally grown coffee and chocolate. Japan has some of the cutest coffees around so you’ve got to give them a shot. Coffee in the country is all about the aesthetics. Expect to find cute latte art on your coffee and quirky snacks on the side when you order a drink in a cafe. Japan also puts a new meaning to the concept of coffee to go and there are loads of canned coffee brands that can be easily picked up from vending machines and shops. Be sure to visit: The Moomin Anti- Loneliness Cafe in Tokyo. This quirky little cafe solves the problem of having no one to go out with by placing solo diners opposite a giant moomin toy. Coffee dates have never been more fun. Not only did they invent the Flat White, Australia revolutionised the way we drink coffee in the UK, from greasy spoon cafes into the artisan cafes of today. On my bucket list is Melbourne, known for its massive coffee culture and brunch spots. If you’re visiting the country then be sure to look for a Bulletproof Coffee. (That’s coffee with butter in it and it’s supposed to be delicious). Denmark is one of the happiest countries in the world and you only need to witness the sociable atmosphere in one of Copenhagen’s bustling cafes to see why. The Danish have a concept called Hygge which is all about cosines, socializing and celebrating the simple things, and hibernating indoors with coffee and friends is integral to this. If you’re visiting Copenhagen then be sure to check out the Vesterbro neighbourhood for the best independent cafes and brunch spots, and it would be criminal not to seek out an Apple Danish when you’re there. We all know Belgium is famous for its chocolate, but what about its coffee culture? Belgium ranks highly on the world coffee consuming country, coming in closely after the Scandinavian countries. Brussels is packed full of quirky and independent coffee shops serving all the blends of coffees, milks and syrups that you could ever want. Probably the best thing about Belgium’s coffee though is the food that goes with it. Not only does the country make some of the best chocolates in the world, it has some of the most tempting breads, pastries and desserts. Be sure to try a Mattetaart- a rich cheesecake filling enclosed within puff pastry, Beignets- small fluffy donuts dusted with icing sugar, gorgeous little cookies in the shape of hands in Antwerpn, and of course the infamous Belgian waffles. The 18,000 beautiful islands of Indonesia are the perfect destination for coffee lovers and hedonists. Take a look at any Instagram photo of exquisite latte art, alongside a colourful smoothie bowl and I almost guarantee that photo was taken in Bali. This island is really leading the way in the coffee scene at the moment and really, what better way is there to spend the day than alternating between Bali’s many cafes and beaches? There’s something romantic and nostalgic about how Cuba paused in time, and that goes for its coffee culture as well as its cars. A cafe Cubana is the country’s traditional drink and is made with whipped sugar and coffee, giving the drink a sweet and foamy top layer. One of my favourite experiences in the country was driving along the quiet road from Havana to Trinidad and making a stop at a little roadside cafe, full of locals and joining the long queue for a coffee. It’s nice to think that as Cuba opens to tourism and start to change, that coffee will always be a certainty. Be sure to visit: Café El Escorial, Havana, for an authentic Cuban Coffee shop with coffee roasted on site. The coffee business is booming in South Africa at the moment. The country is home to Black Insomnia Coffee, officially the worlds strongest coffee, and its cafes have been ranked some of the best in the world. In the past a coffee in South Africa meant an instant one. However a love of coffee has been brewing and in recent years the industry has boomed. Now if you take a visit to Capetown you’ll find it bursting with coffee shops and eateries. Be sure to visit: Truth Coffee, Cape Town, previously voted the worlds best coffee shop for its quirky decor and hand roasted coffee. I had to put the UK on my coffee list. We’re a country known largely for our love affair with tea, but in recent years our love of coffee has steadily grown too. We haven’t invented any remarkably different coffee drinks but what we have done is learnt from the best. If you’re visiting London then head out of the city centre to find the best coffee shops. Camden, Shoreditch and Brixton have plenty of quirky cafes to choose from. Other UK cities such as Manchester, Bristol and Brighton also have thriving cafe scenes. Be sure to visit: If you’re around Covent Garden in London then be sure to check out Neals Yard Courtyard. This little area is well hidden and has a bunch of good cafes, offering a little sanctuary in the heart of the busy city. Portugal often gets forgotten about when it comes to food and drink, compared to its Mediterranean neighbours but it’s high up there as a foodie destination. With its cobblestone streets, spectacular architecture and quaint trams, Lisbon is the ideal place to grab a cup of coffee. The drink of choice is an espresso, that’s um Bica in Lisbon, (or um Combolinho in Porto). You can also order coffees with milk like a latte, um Galao, but like in Italy it tends to be frowned upon to order these after lunch. Of course no coffee in Portugal is complete with a Pateis de Nata, thats custard tart to you and me. Be sure to visit: The best place to get custard tarts are at Antiga Confeitaria de Belem. This established pattiserie sells thousands of tarts each day and always has a queue out of the door, but a Portuguese tart warm out of the oven is something worth waiting for. Traditionally these ingrediants are heated together in a clay pot, which contributes to the coffee’s unique flavour. Do you know any other great countries that coffee lovers should visit? Share your comments below.